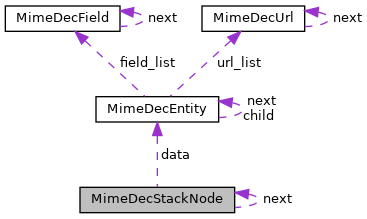 Structure contains boundary and entity for the current node (entity) in the stack. Definition at line 155 of file util-decode-mime.h. Definition at line 157 of file util-decode-mime.h. Definition at line 158 of file util-decode-mime.h. Definition at line 156 of file util-decode-mime.h. Referenced by MimeDecAddEntity(), MimeDecDeInitParser(), MimeDecInitParser(), MimeDecParseStateGetStatus(), SMTPParserCleanup(), and SMTPProcessDataChunk(). Definition at line 159 of file util-decode-mime.h. Referenced by MimeDecAddEntity(), and MimeDecParseComplete(). Definition at line 160 of file util-decode-mime.h.